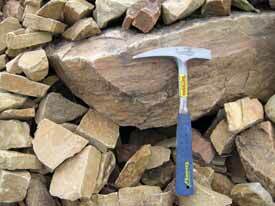 Where Can I Collect Landscaping Rock on Public Land? Quartzite from Utah County, Utah. Landscaping rock or “decorative stone” can be collected from “common use areas” or “community pits” on U.S. Forest Service and Bureau of Land Management (BLM) public lands in various locations across the state. Common-use areas/community pits are for noncommercial or small-scale collection and require a permit. The rules and stipulations for collecting vary from region to region and pit to pit. Blasting is generally not allowed, but some pits allow the use of heavy equipment. Other pits or areas only allow hand loading or excavating. While this article only lists decorative stone collection areas, other earth materials such as sand box sand, clay, and sand and gravel are also available from public lands. If you wish to collect a material or rock type not listed or from a public land site not identified, contact your local BLM field office or National Forest ranger district. They may be able to issue a permit for your proposed site or redirect you to an appropriate area with similar material. Collecting decorative stone as described in this article is subject to different rules and regulations than rockhounding. 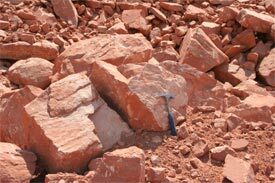 For rockhounding information consult Rules and Regulations Regarding Rock, Mineral, and Fossil Collecting in Utah (PI-23), available for free from the Natural Resources Map and Bookstore (801) 537-3320, or toll free 1 (888) UTAHMAP.